They are the servants of Gravelord Nito, the First of the Dead. They serve their master by spreading disaster to their neighboring worlds through the use of Eyes of Death. The purpose of this covenant is to infect other players' worlds with extra enemies, known as Gravelord Black Phantoms, while also inviting those players to invade the Gravelord Servant's world. This works by enabling the use of the Eye of Death after joining the covenant. 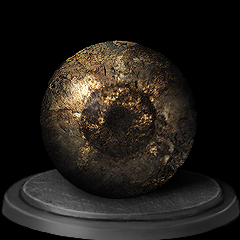 Upon use, an Eye of Death will send a Gravelord soul sign to three other players within co-op range whose worlds are connected to the host's. The infected world will spawn numerous Gravelord Black Phantoms, but only in NG+ or beyond. Up to three infected players can use the soul sign to invade the Gravelord Servant as Spirits of Vengeance. Killing the Servant removes the extra enemies from all affected players' worlds. A weapon and miracles are also available from the covenant. Gravelord Nito must still be alive for joining. To access his coffin, the possession of at least one Eye of Death is needed. Interact with it to join the covenant. Lure other players to invade the Gravelord Servant's world with the use of an Eye of Death. This way, the host still has the advantage (i.e. human form and Estus Flask usage). Check the Eye of Death page on how it works. Killing lured Spirits of Vengeance will reward an Eye of Death in addition to souls. Strong area-of-effect Magic in the form of the miracles Gravelord Sword Dance and Gravelord Greatsword Dance. These miracles have 0 Faith requirement, so they're also suited for Intelligence-based builds using Velka's Talisman. Receive the Gravelord Sword upon joining, one of two weapons in the game able to inflict toxic. Exchange Eye of Death to level up in the covenant. Killing Gravelord Nito will not break the covenant, but there will be no way to level up or join the covenant again for the rest of the current playthrough. REMASTER NOTE: With the ability to change covenants at a bonfire, please be aware that if you quite the covenant and then kill Gravelord Nito, you cannot change back to this covenant at a bonfire, you will still need to continue on to the next NG cycle in order to rejoin the covenant. Nito cannot be harmed when the player accesses his cavern by using the Catacombs' coffin. If the player possesses the Gravelord Sword before joining the covenant (e.g. from another player Online), they will not receive the Gravelord Sword Dance Miracle. To rectify this, quit the covenant and throw away the sword by dropping it and logging off. If this does not work, try again in NG+ for another opportunity to obtain it. Hosts are open to invasions from red phantoms (either from the Darkwraith covenant or players using a Cracked Red Eye Orb); they do not invade via the Gravelord sign and will not drop an Eye of Death upon defeat. Hosts can also be invaded by Blades of the Darkmoon. This can be confusing, since they spawn as blue Spirits of Vengeance, just like players who invade via the Gravelord soul sign, and they cannot harm other blue phantoms. However, they will not drop an Eye of Death if defeated. To prevent Darkmoon Blade invasions, don't get indicted or commit sins. Infected worlds in NG+ or beyond will spawn black phantom enemies. Conversely, when the Gravelord Servant is defeated, all black phantom enemies will dissolve, even if engaged. Sometimes players will get the notification that confirms the defeat of a Gravelord Servant3 without ever noticing the infection take place or finding a Gravelord sign in their world. The extra phantoms usually only spawn for infected players in NG+ and higher. You cannot summon phantoms while the Eye of Death is active. You also cannot activate the Eye of Death if you already have phantoms summoned into your world. You cannot fight any bosses while the Eye of Death is active. 1. After triggering this cutscene the first time, the player will be transported instantly the next time they activate the coffin. 2. This area is free of enemies when accessed via the coffin. 3. "Disasters are gone after the defeat of the Gravelord Servant."